Visit the small village Borganzo during your stay in Liguria, Italy. There is an old bridge from the 17th century in Borganzo. The Parish Church della Nativita di Maria Vergine in the village of Borganzo dates from the nineteenth century and houses an altarpiece by Antonio Brea from the year 1518. You will find a good restaurant (Paolo e Maria) in the locality, serving local ligurian dishes. Festivals, festivals, festivals. Sagre with delicious food and music. During those festivals, immerse yourself into the original life of the ligurian olive farmers. Borganzo is well known in the region for its beautiful festivals with food, dance and music. Time seems to have stood still there. Festivities are held regularly at the village square on weekends, with a changing program, and that happens during the peak season stretching from June to September; for instance, there is the Sagra della polenta e del cinghiale on 30th June, and the Sagra delle trenette al pesto on the last weekend in July. In the Middle Ages this region belonged to the jurisdiction of Clavesana until it was sold to the Republic of Genoa. In those days Diano San Pietro, and therefore also Borganzo, was under the jurisdiction of the Parish of the San Nicola Church in Diano Castello. Genoa created the Communitas Diani from the localities in the whole valley, and these included Diano Marina, Diano Arentino and Diano Castello, until 1797 when the valley, and therefore also Diano San Pietro together with Borganzo and Roncagli, once again became part of the Ligurian Republic. 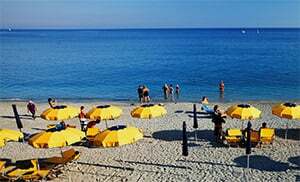 From 1859 to 1926 the valley was under the sovereign jurisdiction of Imperia /Porto Maurizio until 1923 when the various localities forming the municipality rebelled against their oppression and were incorporated into the municipality of Diano Marina. Diano San Pietro then became an autonomous municipality again in 1925. Diano Borganzo is part of the municipality of Diano San Pietro in the province of Imperia in Liguria. You follow the highway exit of the A10 at San Bartolomeo al Mare, then along the SS1 coastal street in a westerly direction up to Diano Marina, and from there you follow the road signs to Diano San Pietro / Diano Roncagli. Diano Borganzo is approx. 2.33 kilometers away from the center of the municipality of Diano San Pietro. The following localities are part of the municipality of Diano San Pietro, Borganzo (2.36 km), Camporondo (2.6 km), Moltedo (1.34 km), Roncagli (3.86 km), Trinita' (1.75 km) and Trucci (2.30 km).